International Computers Ltd (ICL) (see below for locations) was a large British computer hardware company that operated from 1968 until 2002, when it became Fujitsu Services Limited. The company's most successful product line was the ICL 2900 Series range of mainframe computers. ICL represented the last step in a series of mergers that had taken place in the British computer industry since the late 1950s. 1963 English Electric and J. Lyons and Co formed a jointly-owned company, the English Electric LEO Co, to manufacture the LEO Computer which had been developed by Lyons. 1964 English Electric bought out Lyons' share of English Electric LEO Company; it had previously taken over Marconi's Wireless Telegraph Co in 1946, as a means of entering the UK consumer electronics market. The new acquistion was merged with Marconi's computer interests to form English Electric-Leo-Marconi Computers (EELM). 1968 As a result of the Industrial Expansion Act, English Electric Computers was then taken over by International Computers and Tabulators (ICT) to form International Computers Limited (ICL). By this initiative, the Ministry of Technology aimed to create a British computer industry that could compete with major world manufacturers such as IBM. Plessey Co and English Electric each owned 18% of the equity of ICL, with 53.5% in the hands of former shareholders of ICT and the remaining 10.5% held by the government. On its formation the company inherited two main product lines: the ICT 1900 series of mainframe computers and, from EELM, a range of IBM-compatible mainframe computers, System 4. In later years ICL attempted to diversify its product lines but the bulk of its profits always depended on the mainframe customer base. New ventures included marketing a range of powerful IBM clones made by Fujitsu, various mini-computer and personal computer ranges, and (more successfully) a range of retail point-of-sale equipment and back-office software. 1970-1 Almost as soon as the development of the new range of computers had started, there was a recession in the computer market. To maintain the momentum of the R&D programme, the government somewhat reluctantly provided a loan of £40 million. 1974 The New Range was finally launched as the 2900 series, two years late. On the basis of the 2900 series and its small business systems the ICL 2903, and the System Ten acquired from Singer the remainder of the 1970s was a very good period for ICL. It achieved an annual revenue growth of 20 per cent right up to the end of the decade. ICL tended to rely on large contracts from the UK public sector. Significant customers included Post Office Ltd., the Inland Revenue, the Department for Work and Pensions, and the Ministry of Defence. 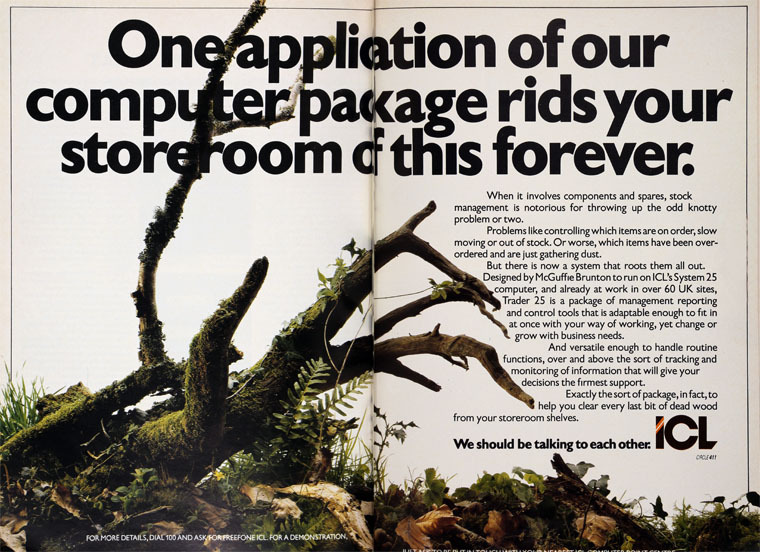 By 1981, ICL needed a cheaper source of technology to develop lower-end machines in the 2900 range to compete with the IBM 4300 series but it ran into a financial crisis, leading to a takeover bid from Unisys. The British Government stepped in with a loan guarantee for ICL, enabling the company to stay independent, and introduced Robb Wilmot as Chief Executive. Wilmot cancelled the in-house development of large-scale integrated circuit (LSI) technology and, instead, negotiated an agreement that gave access to Fujitsu's LSI and packaging technologies. Combined with ICL's in-house CAD capability, this enabled ICL to design and manufacture the Series 39 level 30 and 80 computers. Initially, the collaboration with Fujitsu was presented as being an arm's length one, to avoid diluting ICL's credentials as a European and British company. 1981 Launched a new high-volumed computer - the System 25. 1982 Christopher Laidlaw, chairman of ICL, was knighted in The Queen's Birthday Honour's List for his efforts in the company revival. 1984 Standard Telephones and Cables (STC) took over ICL. The rationale for this was said to be the expected convergence of computers and telecommunications. Wilmot remained at the company along with Peter Bonfield as marketing director. The merger was soon followed by a financial crisis at STC, leading to Arthur Walsh becoming chief executive of STC and Bonfield being appointed as chairman and managing director of ICL. Within a few years ICL was contributing 60% of the profits and turnover of the combined group. Fujitsu's involvement with ICL steadily increased; in 1990 Fujitsu acquired 80% of ICL plc from STC. Following the acquisition of Nokia Data in 1991, personal computers and servers were marketed under the ICL brand. Eventually Fujitsu acquired full ownership of ICL and subsequently fully integrated it, dropping the ICL brand. 1999 a joint venture between Fujitsu and Siemens absorbed all of ICL's hardware business, with the exception of VME mainframes, and the whole of Siemens' Nixdorf business except for banking and retail systems. 2009 Fujitsu Siemens in turn was merged into Fujitsu. The company had various buildings at Bracknell (its main one being at Lovelace Road in the town); it also had numerous locations throughout the UK and worldwide. Manufacturing took place in Letchworth (Hertfordshire), Manchester and the Midlands (including Kidsgrove). It is thought that there were over 100 ICL locations in the UK alone with many more overseas. Because of the complexity of the number of UK buildings each was identified by three alphas for the town/city and then a number. The main Bracknell building was BRA01. All London buildings were prefixed LON. The company’s corporate head office was at Putney in southwest London and was designated LON11. The building was on the south end of Putney Bridge with two further ICL buildings at the north end of the bridge. This page was last edited on 25 October 2017, at 15:51.